2. Trim meat into cubes removing any fat or gristle as required. 3. Toss the meat in the seasoned flour and then brown the meat with the onion, using the AMKO Beef Dripping. 4. Add the beef stock, bay leaf and the diced carrots and place in the oven for 2 hours or until the meat is tender. 5. To make the dumplings. mix the self raising flour, AMKO Shredded beef suet, salt & pepper together with a little water. Mix together using a knife, then with floured hands form the dough into small golf sized balls, add to the casserole for the last 30 minutes of cooking time. Tip! For extra light and fluffy dumplings – add to a simmering stew and do not open the lids during the cooking time. 1. Pre heat oven 220C/425F/Gas Mark 7. 2. Peel potatoes and cut into large chunks. Parboil in boiling, salted water for 5 mins. Drain and toss in the pan to roughen the edges. 3. Melt plenty of AMKO Goose Fat in a shallow baking tray till smoking. Carefully place part boiled potatoes into the tray and bake for approx 45 mins until cunchy on the outside and soft in the middle. Baste occasionally to make sure they colour on all sides. Mix the content of the Amko Pancake Mix with 250m (10fl oz) cold water. Add one egg and whisk. Allow to stand for a few minutes. Heat a small amount (desert spoonful) of oil in a frying pan. Pour approx 1/4 of the mix, enough to cover the base of the pan. Cook through for 5 mins turning once. 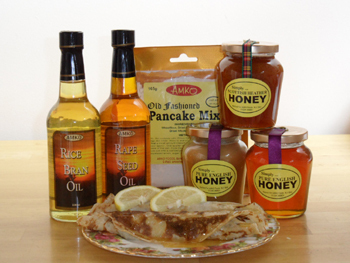 Turn out onto a warmed plate, add choice of freshly squeezed lemon/sugar/honey/maple or plain syrup.